Ally Scraps: She's Up to Something! That Heidi Swapp has done it again! She has managed to create another product that we will all have to have! - 3 great new pattern paper collections!!! 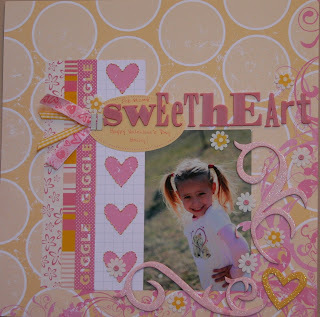 I used the new Heidi Swapp Carefree line to make this page of my daughter, Hailey at Valentine's Day. The pink and yellow are so soft together! Heidi is not only talented, but knows that "I" am a scrapbook supply hoarder because she created these lines to coincidentally match her first release products! I was able to add my "old school" Heidi Swapp plastic letters and some of the many rolls of Heidi Swapp tape I have saved for the "perfect project"! Now, go hurry up and order some of these delicious papers and embellishments before they are gone! wow, that's such a pretty LO!!!! I love the stitching, the glitter, the colors!!! This is so girly! I love the colors! Want to get more mileage from a sketch?